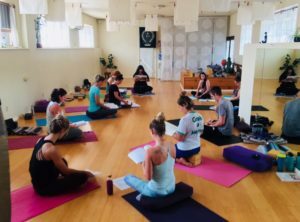 The Yoga Loft’s 200 hr teacher training program is designed for those who would like to become teachers, as well as for those who would like to broaden their yoga knowledge and ability. This program offers a comprehensive training of Hatha yoga that includes teaching techniques, training and practice, meditation, breathing practices, western anatomy and physiology, energetic anatomy (chakras, nadis, bandhas, etc. ), yoga philosophy and history, lifestyle and ethics, Ayurveda, as well a great deal of teaching practice. Rather than focusing on one specific style, we offer a variety, allowing you to have a range of teaching ability and experience. While we center on alignment-based yoga and vinyasa flow yoga, we introduce a variation of yoga styles including: Restorative, Yin, Kundalini, yoga with hand weights and more. There will be ample focus throughout the practice on creating a safe, thoughtful and inclusive yoga practice for bodies of all shapes and abilities. Our experiential learning process gives you plenty of room to explore and develop a style of teaching that resonates with you. This is an active learning process for students involved, offering the experience of teaching from the very first day. By the end of the training you will have fully sequenced and taught a 60 minute class, in addition to the many hours of teaching practice you will do throughout the training. 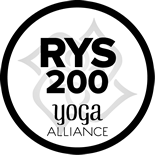 It is our goal to help you feel knowledgeable, secure and confident in your ability to practice and teach yoga. You will have the opportunity to study with your favorite Yoga Loft teachers that you have known and trusted throughout the years. We recognize that every body is different and respect each person’s level and ability. You do not have to be an advanced yogi to take this program! This program is for those with a desire to learn and grow in their own practice, as well as a love for yoga that they would like to share with others! Training will take place on Saturdays and Sundays, every other weekend, and will amount to 12 hours per weekend. There are two weekends in the training where we only meet on a Saturday. We understand that there may be some days missed throughout the training. Please discuss with me any dates you know you will not be able to attend so we can plan accordingly for make-up hours. You will need 200 hours completed before you are able receive a certificate. You will need to attend 12 additional yoga classes throughout the training with an approved Yoga Loft trainer. Approved trainers are Jessica Katz, Cherie Newman, Hoyt Cory and Christian Damek. All other classes offered at the Yoga Loft will be $5 during the length of your training. You will also have 20 hours of of homework, study and projects that you will work on outside of training weekends. Fill out and submit an application form below. If you get an acceptance letter then you will need to set up a time to either have a short phone interview or in person interview with the lead trainer, Jessica. If we do not hear from you within 2 weeks after the acceptance letter we will assume you are no longer interested and remove you from our list. After the interview, you will need to put down a $100 deposit to officially hold your spot. We cannot guarantee you a spot if the training fills up and you did not put down a deposit. You will be able to make this deposit online through our store page, in person, or by mail depending on which you prefer. You will also need to let us know which payment option you are making. * Please note that the deposit is non-refundable. Once you have put down a deposit you are officially enrolled and will receive our reading list and other important information leading up to the training. We do require that to join the training you have had some previous yoga experience. If you have only had limited yoga experience then you may be required to take yoga classes with the lead trainer before the start of the training. This will be discussed during your interview. A $100 deposit is required to reserve your space in the training. This $100 goes towards the total cost of the training and is non-refundable. Please be confident that you are committed to completing this training before putting down a deposit, as we only allow 12 students into a training. $1500 if doing the payment plan- $250 due the first meeting of every month (May-October). First payment is due on May 4th. The $100 deposit goes towards your last month of payment (October) and will be subtracted from it. *These prices do not include the books needed for this training. The books used for this program are reasonably priced and are usually available new and used on Amazon.com. We do not offer refunds for the monthly payment plan. After September 22nd no refunds will be given. A $100 deposit is required to reserve your space in the training. This $100 goes towards the total cost of the training and is non-refundable. $1500 if doing the payment plan- $250 due the first meeting of every month (Sept.-Feb.). First payment is due on September 22nd. The $100 deposit goes towards your last month of payment (February) and will be subtracted from it. After Jan. 19th no refunds will be given.